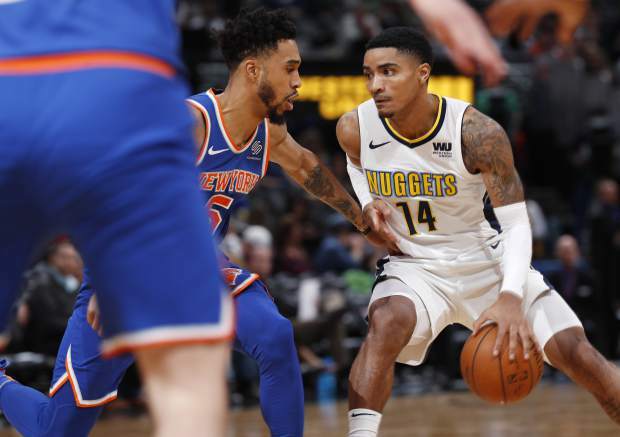 DENVER — Gary Harris scored 23 points, Trey Lyles had 21 and the Denver Nuggets beat the New York Knicks 130-118 on Thursday night. Jamal Murray and Nikola Jokic added 18 points apiece for the Nuggets, who defeated the Knicks for the 10th time in a row in Denver. New York hasn’t won in the Mile High City since 2006. Seven Nuggets scored in double figures. Kristaps Porzingis, returning to action after missing Tuesday’s loss at Golden State with a sore knee, and Michael Beasley each scored 21 points for the Knicks. Enes Kanter had 20 and Trey Burke 18. Trailing by 13 at the half, the Knicks pulled to 87-79 on a jumper by Burke with 4:55 left in the third quarter. They trailed 99-92 heading into the final period after Burke connected on a fadeaway shot. The Nuggets, though, scored 10 straight points to start the fourth quarter, including 3-pointers by Will Barton and Lyles to rebuild Denver’s lead to 109-92. New York put together a 9-0 burst to pull to 114-106 but Porzingis fouled out with just under 5 minutes remaining and Murray drained a key 3-pointer with 2:41 remaining to put the Nuggets back up by 11 points. Harris added a jumper a little more than a minute later to quash the Knicks’ comeback bid. The Nuggets had their highest point total in a half this season, leading by as many as 18 points before settling for a 73-60 advantage at the break. Harris played a big role in the Nuggets’ blistering offensive display, scoring 18 points during the first two periods. Knicks: C Joakim Noah was not with the team, having been excused for personal reasons. He’s expected to miss two games. … F Kyle O’Quinn was held out of the game because of a bruised left calf. … G Tim Hardaway Jr. was inactive after recently returning from a leg injury. Nuggets: F Kenneth Faried missed a second consecutive game with left ankle soreness. … The 39-point first quarter matched a season high for the opening period. Denver also had a 39-point first quarter against Orlando on Nov. 11. Knicks: Visit Phoenix on Friday to complete a season-game road trip.